Stay a little longer in paradise at this Hawthorn Suites by Wyndham Corpus Christi hotel, close to downtown Corpus Christi shopping and nightlife, and sparkling South Padre Island beaches. There is no smoking allowed at this hotel, which features complimentary wireless Internet and a complimentary breakfast buffet. Splash in the outdoor pool and jetted tub and work out in the exercise room. Join your friends and colleagues at the social hour on weekday evenings. Refresh your wardrobe with the laundry facilities and dry-cleaning service. 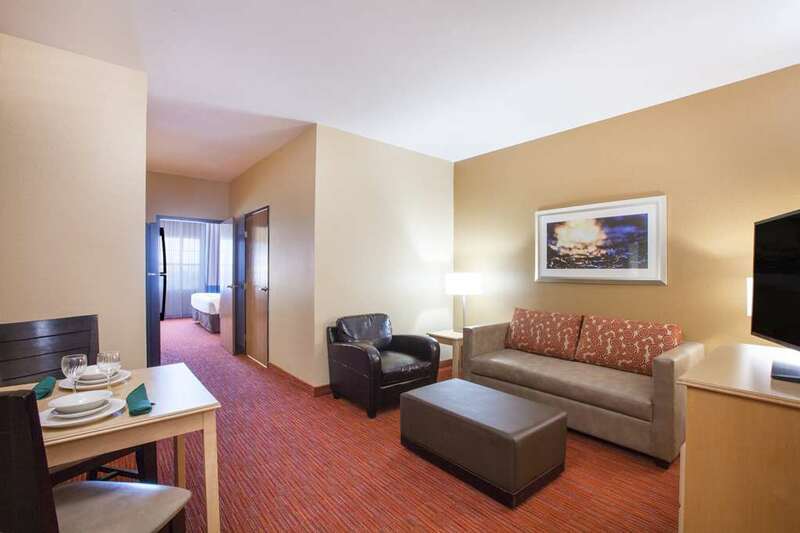 Each room features a microwave and refrigerator, perfect for longer stays. Business travelers will appreciate the business center, meeting rooms, presentation equipment and supplies, computer access and fax service. Charge your car with one of our two Tesla Connectors, rated up to 16kw. Accessible rooms are available, and there is no charge for kids through age 17 when staying with adults. Two Tesla Connectors up to 16kw are available.